Doritos, one of the flagship brands from PepsiCo’s Frito-Lay division, today unveiled its campaign and advertisement for Super Bowl LIII on Feb. 3. Titled “Now It’s Hot,” the creative (watch here) showcases a never-before-heard remix by Chance The Rapper of the Backstreet Boys’ massive hit “I Want It That Way,” the first time the pop group has ever collaborated to remake a hip-hop version of their legendary music video. A :30 version will air during the CBS broadcast of the game. The commercial features Chance tasting new Doritos Flamin’ Hot Nacho, realizing that “they made the original hot,” when he’s suddenly thrust onto a set like the one featured in the Backstreet’s Boy’s iconic “I Want It That Way” music video. 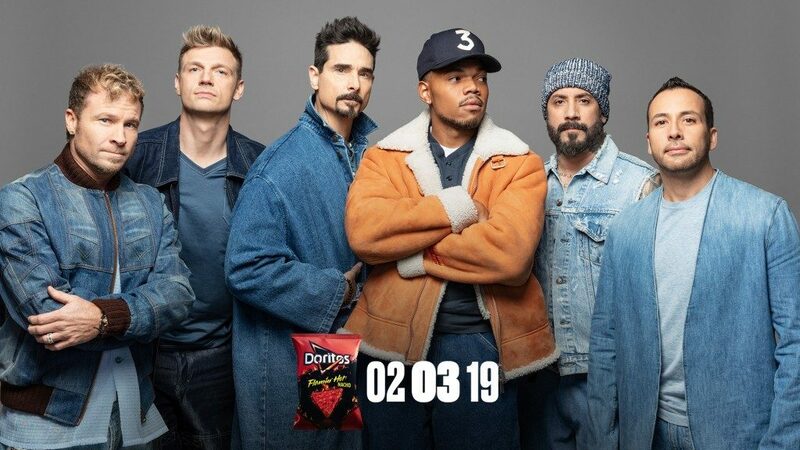 Chance decides he too can make the original hot and debuts his fire version of the classic hit alongside the Backstreet Boys. The spot kicks off Doritos’ #NowItsHot campaign that will continue on social media and TV in the coming weeks and months with more epic content and remix collaborations. #NowItsHot furthers Doritos’ history in music — especially hip-hop — with major music campaigns tied to previous Super Bowls, festivals and events such as SXSW, Life is Beautiful, E3 and more. It doesn’t just stop on Super Bowl Sunday. Want to “Backstreet-ify” yourself? Using an exclusive Snapchat lens available starting on Super Bowl Sunday, fans can go full “Backstreet,” creating dynamic content of themselves in iconic ’90s accessories inspired by the Backstreet Boys. Think classic hats, jewelry, signature clothing, pink smoke and more. Doritos will also support the campaign with concert-style posters in the New York City area and media on music sites such as Spotify. Fans can get in on the conversation by following @Doritos and #NowItsHot on Twitter and Instagram. The #NowItsHot campaign is in support of new Doritos Flamin’ Hot Nacho, a hot twist on an original flavor — much like Chance the Rapper’s hot twist on the iconic, original “I Want It That Way” hit by the Backstreet Boys. For the first time on a tortilla chip nationwide, the new flavor offers a combination of the popular hot and spicy flavor of flamin’ hot and the timeless flavor of original nacho cheese.